Woodlawn is rising again … though the challenges, like gravity, seem never to go away. Its comeback slowed by the Great Recession, its people saddened by the death of a beloved leader, the storied South Side neighborhood is rallying around an ambitious housing development and other locally driven plans for safer streets and better schools. The Rev. Dr. Byron T. Brazier has followed in the considerable footsteps of his father, Bishop Arthur M. Brazier, while bringing his own business background to his role as chair of the Network of Woodlawn. There’s a new thrust, too, coming from a native son determined to see his father’s vision come true. But the Rev. Dr. Byron T. Brazier goes about the work a bit differently than did his father, Bishop Arthur M. Brazier, who built Apostolic Church of God into one of the city’s largest and most influential congregations. Perhaps that’s because Byron Brazier, before returning to help his father manage the 22,000-member church in the late ’90s, first honed considerable management skills working for Johnson & Johnson, IBM Corporation and then his own consulting firm. Bishop Brazier, who passed in October of 2010, had woven a network of intensely personal relationships that stretched from movers and shakers such as former Mayor Richard M. Daley, to the bus drivers and beat cops on 63rd Street. In the ’60s he founded The Woodlawn Organization (TWO) to fight urban renewal abuses. Later he worked with the city and the University of Chicago on a succession of community redevelopment efforts and was closely involved with LISC Chicago’s New Communities Program (NCP). Byron Brazier shares his father’s fire, though he also brings a gift for organization that might be just what Woodlawn needs at this stage of its redevelopment. Dr. Brazier chairs the Network of Woodlawn, or NOW, which has succeeded the NCP/Woodlawn coordinating team as the neighborhood’s NCP flagship. The Network of Woodlawn's Wesley Walker and the University of Chicago's Will Towns foresee continued renewed growth along 63rd Street. Not when one-third of Woodlawn children still live in what’s officially described as “deep” poverty and when nine of its elementary schools face sanctions for missing state targets on standardized tests. Not when gun-related youth violence continues to weigh on all aspects of life, what with 42 murders in the neighborhood last year compared to 36 in 2011 … and another three just in the first month of 2013. Not when many longtime homeowners view with some suspicion the subsidized housing being built and rehabbed hereabouts – the source, they claim, of many of the neighborhood’s problems. So complex are the challenges that Dr. Brazier and his NOW board determined early on that the typical soup-to-nuts organizational format wouldn’t work for this new community development corporation. In order to attract more outside investment – public investment, private investment, philanthropic investment – and to better manage those investments, NOW is being set up as an umbrella overseeing four distinct non-profit subsidiaries, each with discreet but mutually supporting budgets, goals and strategies. Bill Eager of the Preservation of Affordable Housing, Inc., says partnerships are remaking Woodlawn. Education – Centered on the Woodlawn Children’s Promise Community, a joint effort with the U. of C. and others to upgrade the neighborhood’s so-so public schools. Children’s Promise will encompass all stages of human development, from pre-natal nurturing to post-graduate career placement, all modeled on the Harlem Children’s Zone in New York City. Public safety – Centered on the Woodlawn Public Safety Alliance, created last year as an antidote to increasing youth violence. Most shootings occur south of 63rd Street and west of Cottage Grove Avenue, but the shadow of violence threatens to erode the entire community’s sense of wellbeing. Health & Human Services – A broad, multi-partner effort to deal with challenges ranging from asthma (the leading cause of school non-attendance) to binge drinking to the unavailability of fresh fruit and vegetables. Community Development – Centered on a new Woodlawn Partnership for Economic Development, the effort aims to “incubate, initiate and coordinate” a stable economic foundation for the community. Consultants are doing an inventory and outlining possibilities that build on the 2005 NCP quality-of-life plan. It’s all very ambitious, to be sure, but Dr. Brazier has chosen well the person who’ll be coordinating the effort full-time. Wesley Walker, once a program officer for LISC Chicago, has returned from a tour of community development work in the Twin Cities to take over as Network of Woodlawn’s executive director. A decade ago Walker helped roll out NCP. Now, he suggests, Woodlawn’s new approach may prove a viable model for other local NCP affiliates as they move into the looser-but-wider New Communities network. POAH's Felicia Dawson helps families return to Woodlawn Park. The danger, of course, is the complexity of administering five distinct organizations – NOW plus the pillars – whose partners and constituencies are sure to overlap. But Walker, like Dr. Brazier, predicts the benefits will outweigh any difficulties. For one thing, both argue, grant-makers generally prefer to support issue-specific programs with defined goals and measured outcomes, as opposed to umbrella groups like NOW with a more comprehensive outlook. For another, NOW is setting up to provide “back office” support to all four subsidiaries, minimizing bureaucratic drag. The NOW experiment is being watched closely, to be sure, by several funders and partners including LISC Chicago’s Executive Director Susana Vasquez. She might have preferred a simpler organizational model but respects the local vision to not only continue promoting comprehensive planning, but to begin building the organizational infrastructure for comprehensive implementation. Byron Brazier is a close confidante of Mayor Rahm Emanuel. 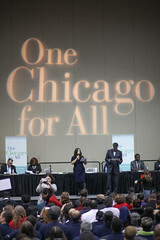 Dr. Brazier co-chaired the mayor’s transition committee and is an Emanuel appointee to the Public Building Commission. He also chairs the aforementioned Children’s Promise Community and is on the board of several influential civic groups such as Metropolis Strategies and the Metropolitan Planning Council. See a larger version of this chart. Not that Dr. Brazier is a fan of everything coming down the pipe from City Hall. He doesn’t hide his skepticism, for instance, about a forthcoming city concept plan to convert many of the vacant lots in west Woodlawn and nearby Washington Park into community gardens, ball fields and other open space amenities. Byron Brazier has a larger vision for Woodlawn. Granted it may never regain the 81,000 folks who called it home back in 1960, before white flight and a half-century of neglect reduced that number by two-thirds. But its location – on the lakefront, next to one of the world’s great universities, bracketed by first class parks and public transit – makes it a natural for what he sees as an inevitable next wave of real estate development. Then again, other leaders who had input to the city’s forthcoming Green & Healthy land use plan for the mid-South Side – including Ald. Willie Cochran (20th) and the U. of C.-affiliated Southeast Chicago Commission – are sure to seek Dr. Brazier’s support, especially on the plan’s call for commercial redevelopment of transit “nodes” such as 63rd and Cottage Grove. The embodiment of Dr. Brazier’s more densely populated vision is rising along both sides of Cottage Grove north of 63rd Street. Where a worn-out warren of low-income housing known as Grove Parc once stood, now rises Woodlawn Park, a stylish, post-modern mix of affordable apartments and town houses. The developer is the Boston-based non-profit POAH (for Preservation of Affordable Housing, Inc.) and its work is underwritten not just by federal rent subsidies and tax credits but by an innovative companion grant called the Choice Neighborhoods Initiative. The idea behind HUD’s first-ever Choice grant is to amplify the impact of Woodlawn Park by leveraging ripples of revitalization across the entire neighborhood. Woodlawn Park, a stylish, post-modern mix of affordable apartments and town houses, now rises where the rundown Grove Parc once stood. One example of that: a homebuyer support program that aims to bring 80 middle-class families into the mix. All of Grove Parc’s original 504 subsidized apartments will be replaced. Many are located in existing but newly rehabbed apartment buildings not far from the LEED-certified new construction along Cottage Grove. Other initiatives funded in part by the $32.5 million Choice grant include plans for a Center for Working Families satellite managed by Metropolitan Family Services, plus support for the Network of Woodlawn along with its education and public safety initiatives. Dawson has her hands full, however, diffusing the fears of some longtime residents, especially homeowners, leery of so many rent-subsidized families moving nearby. POAH’s Dawson begs to differ, arguing that the rehab and re-occupation of West Woodlawn’s foreclosed and vacant walk-ups is stabilizing an at-risk neighborhood. Less obvious but no less real, Dawson said, has been a coming together of east and west Woodlawn. Too often they were “like the Hatfields and McCoys,” with folks west of Cottage feeling they were passed over in favor of the more well-endowed east. Bill Eager, POAH vice-president for Chicago operations, lays much of the program’s success to President Robert Zimmer of the University of Chicago and his vice president for civic engagement, Derek Douglas. “We’ve got the social services working hand-in-glove with property management, the youth programs working with the schools, the university with the community,” said Felicia Dawson, who manages tenant relations for POAH at Woodlawn Park. For instance, the university was quick to chime in with $1 million in support of the recently announced Gigabit Neighborhood Gateway Program. Coupled with a $2 million state grant, the plan is to connect Woodlawn and other mid-South neighborhoods into a college-centric broadband network that eventually will serve nearly 80,000 households. Eager also welcomes the school’s encouragement of employees to rent market-rate units at Woodlawn Park or, better yet, buy Woodlawn two- or three-flats through the school’s Employer Assisted Housing program. The university is also a mainstay of the Children’s Promise school program and is expected soon to announce construction of a charter school on 63rd Street. To one degree or another, LISC Chicago has seeded much of what’s happening in Woodlawn. From its 10-year backing of NOW and its NCP antecedents to predevelopment loans on Woodlawn Park; from loans and equity investments on some 500 homes elsewhere in the neighborhood to its technical and financial support of the Choice Neighborhoods and Children’s Promise applications, LISC has been there. It may well be, though, as the New Communities platform expands across the city to become a wider network of tools and relationships, that Network of Woodlawn is, in a way, paying it back by becoming a viable model for NCP’s next phase. Not the only model, perhaps, but one capable of making real the dreams of an earlier generation of community leaders, beginning with those of the late Bishop Arthur Brazier.